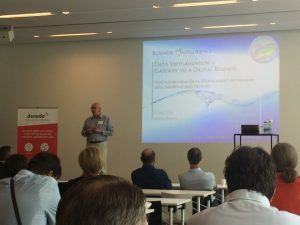 Denodo and InfoRoad organized the Next-Generation Data Management Afternoon last week. Attendees learned all about data virtualization during speeches given by Barry Devlin (visionary in the Big Data & Analytics area), Alberto Pan (CTO Denodo) and Jean-Luc Van Doninck (customer testimonial BNP Paribas Asset Management). InfoRoad services and market view on DV were presented by Bart De Groeve, InfoRoad practice leader. Thanks to all attendees to join us at the event.